mmsonline.com September 2017 MMS 121 BETTER PRODUCTION Shops Using Technology pieces for a company that man- ufactures and sells splicing, strip- ping and cleaning machines for the fiber-optics sector. It also m a c h i n e s p a r t s f o r a r o a d - c o n s t r u c t i o n c o m p a n y t h a t builds scrapers to retrofit with articulating trackers. Most of his experiences work- ing with buyers have been pos- itive, Mr. Donath says, and some h a v e b e e n m e m o r a b l e . F o r instance, he saw par ts up for b i d f ro m th e M a s s a c h u s et ts Institute of Technology. "I was a bit skeptical, but submitted a quote nonetheless," he says. Eventually, a student called to discuss the parts, which were necessar y for a robot for the television show "BattleBots," in which competitors build robots and fight them in an elimination tournament. "MIT sent me pic- tures showing me the location of the parts I machined," he says. "It was pretty exciting." According to Mr. Donath's estimates, he has gotten more than 100 jobs from the platform. M a n y h a v e b e c o m e r e p e a t customers who now work with him outside of the platform. He e stimate s that 75 p e rc e nt of the company's existing custom- ers came from MFG.com, and four or f i ve ma ke up most of the revenue. He says that he plans to con- tinue using MFG.com to find more long-term customers. He also recognizes that the industry can be unpredictable, a lesson he learned when one of his f irst clients took its work in house. "You never know what life holds," he says, "but I know I can always count on MFG.com for the work my shop needs." 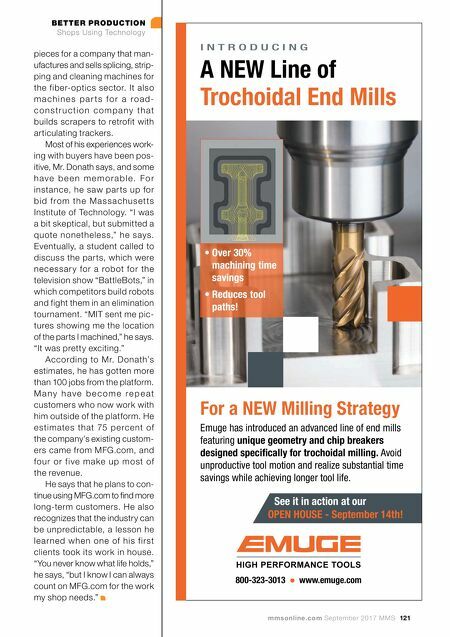 For a NEW Milling Strategy Emuge has introduced an advanced line of end mills featuring unique geometry and chip breakers designed specifically for trochoidal milling. 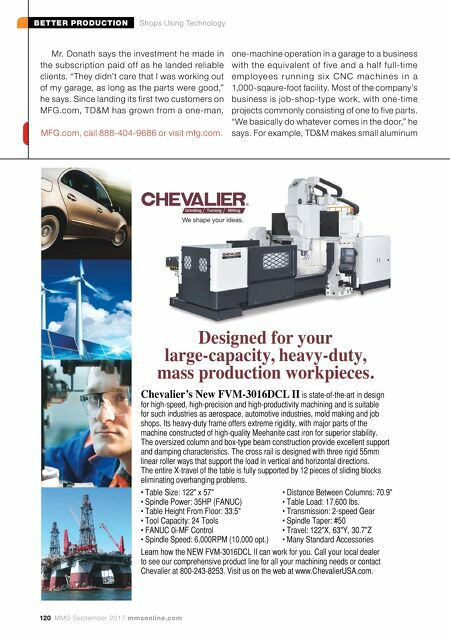 Avoid unproductive tool motion and realize substantial time savings while achieving longer tool life. I N T R O D U C I N G A NEW Line of Trochoidal End Mills 800-323-3013 • www.emuge.com • Over 30% machining time savings • Reduces tool paths! See it in action at our OPEN HOUSE - September 14th!